St. Rita School for the Deaf is the only school in the country that has educational programs specifically designed for children with apraxia. 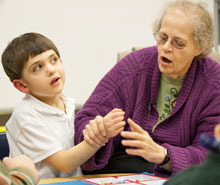 St. Rita School delivers a curriculum through multisensory instruction that meets the specific needs of each student. The fulltime academic program integrates academics with the arts, athletics, social development, and community service to provide a well-rounded curriculum. Our teachers have specialized training not only in their primary area of instruction, but also in specialized techniques that are specifically designed to apraxic students in an engaging and encouraging way. One of the greatest instructional needs for our apraxic students is that of a highly structured, small class setting. With St. Rita School for the Deaf average teacher-to-student ratio of one to six, students in grades K through 12 are automatically given a head start on their road to successful learning.